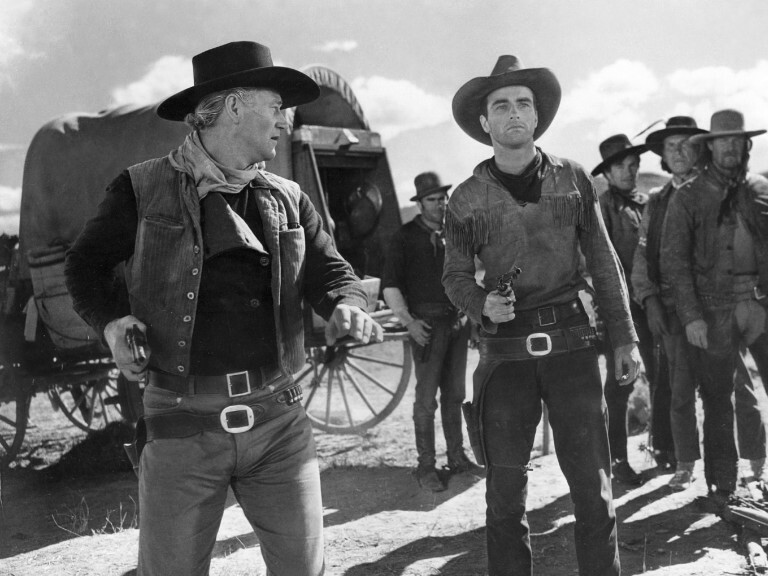 Howard Hawks shot Red River in 1946, but its release was delayed due to legal difficulties. The eccentric Howard Hughes contended that parts of Red River were taken from his “lust in the dust” western The Outlaw (1943), which starred Jane Russell and her magnificent breasts. 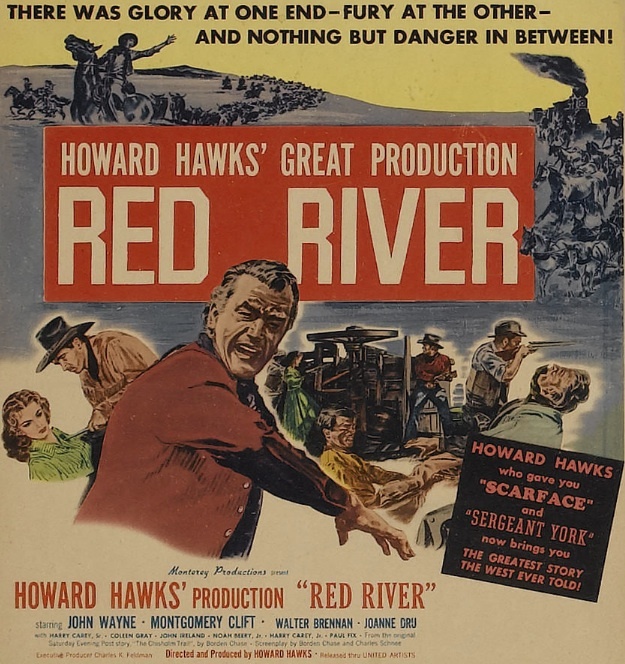 Anyone who’s seen both Red River and The Outlaw can tell you that any claim of story infringement is spurious, but there was bad blood between Hughes and Hawks (Hawks had worked on The Outlaw as an uncredited co-director), and it took until August 26, 1948, before Red River finally had its premiere. So while Fred Zinnemann’s The Search (1948) was the film that introduced many moviegoers to Montgomery Clift, Red River was his first acting role in a feature film. Clift was a born movie star. He was achingly handsome, rail-thin, and blessed with a uniquely vulnerable type of masculinity. On screen, he had a presence that seemed completely natural. 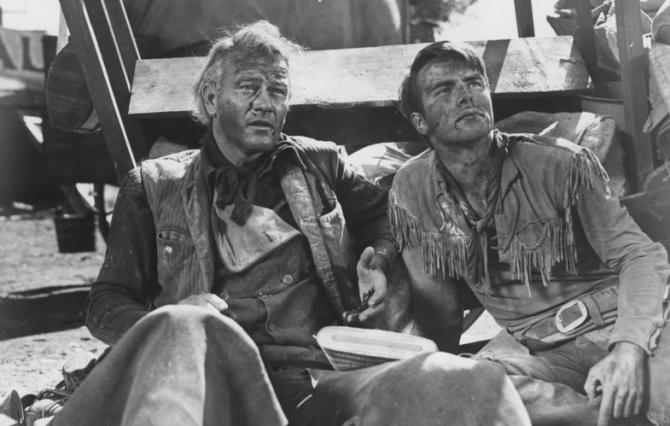 Red River is a phenomenal western that works on a number of different levels, but one of its most important aspects is the relationship between Clift and the film’s star, John Wayne. Wayne and Clift were on opposite ends of the spectrum in every way imaginable; politically, professionally, physically, and sexually. But it’s this contrast that makes Red River work so well. Red River is the story of a cattle drive along the Chisholm Trail up from Texas. Thomas Dunson (John Wayne) is a big, tough cattleman who took his land by force. 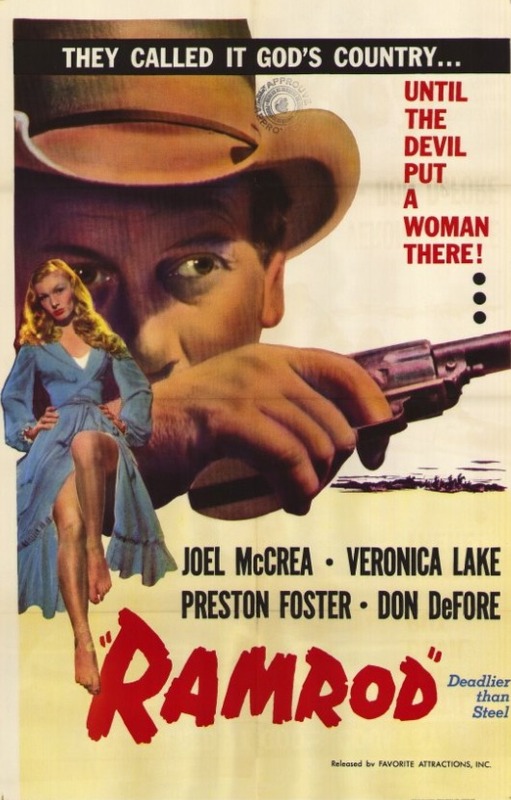 When Dunson was first establishing his grazing land with his best friend Nadine Groot (Walter Brennan), the woman Dunson loved (Coleen Gray) was murdered by Comanches, and he never loved another. Fourteen years pass, and Garth grows up, now played by Montgomery Clift. The Civil War has ended, and Dunson is no longer able to sell beeves to the impoverished southern states. He decides that he’ll drive his entire herd north to Missouri, where they’ll fetch a fortune. He’s spent his life building his empire, and he wants to pass it down to Matt Garth, his protégé. The only problem is that Dunson’s greatest strength — his unbending will — is also his greatest weakness, which eventually puts him at loggerheads with the more even-tempered and empathetic Garth. Borden Chase, who wrote the Saturday Evening Post story on which Red River was based (as well as the screenplay for the film with Charles Schnee), drew liberally from Mutiny on the Bounty in crafting his story. Despite the fact that his middle name was “Winchester,” this was Howard Hawks’s first directorial credit for a western, which is remarkable considering he’d been directing films since the 1920s and had more than one masterpiece under his belt. In addition to his own estimable talents as a director, Hawks had some of the finest crew members who ever worked on a Hollywood western when he made Red River. Composer Dimitri Tiomkin’s score is epic. Editor Christian Nyby’s cutting drives the film forward with relentless intensity. And cinematographer Russell Harlan had toiled away for years working on B pictures (mostly westerns) before finally breaking into A pictures with Lewis Milestone’s war movie A Walk in the Sun (1945). He went on to become one of the best cinematographers in the business, and his work on Red River is proof. Red River is one of the greatest westerns ever made. As I said above, it works on a number of different levels. At its most basic level, Red River is a rousing adventure film about men on a dangerous mission, struggling against the elements and against each other. But on a deeper level, it’s a timeless myth about fathers and sons. Red River will be shown on TCM this Friday, March 1, 2013, at 10:15 PM ET. *If you’re a fan of sexual innuendo in old movies, the scene in Red River in which Matt Garth and gunslinger Cherry Valance (John Ireland) compare revolvers is a classic. Many see a gay subtext, which could be there, but gay men hardly have a monopoly on comparing phalluses to see whose is bigger. I think the sexual bonding between men in Red River goes much deeper. Remember that the herd being driven up the Chisholm Trail in Red River are all descended from the union between John Wayne’s bull and Montgomery Clift’s cow. Even though Dunson and Garth are not blood relations, they are bound together. Posted in 1948, August 1948 and tagged Christian Nyby, Coleen Gray, Dimitri Tiomkin, Howard Hawks, Joanne Dru, John Ireland, John Wayne, Monterey Productions, Montgomery Clift, Russell Harlan, United Artists, Walter Brennan, Westerns. Bookmark the permalink. They called it God’s country … until the Devil put a woman there! screams the poster for André de Toth’s Ramrod. That darned Scratch. Goin’ and puttin’ women where they oughtn’t to be. The woman in Ramrod is Connie Dickason, whose slight frame and small stature belie her will of iron. She’s played by Veronica Lake (de Toth’s wife from 1944 to 1952). Connie’s fiancé, Walt Shipley (Ian MacDonald), plans to bring sheep through public grazing land, which hasn’t endeared him to local cattleman Frank Ivey (Preston Foster), who has Connie’s father, Ben Dickason (Charles Ruggles), in his pocket. Connie hires Dave to be foreman of her ranch, the Circle 66. He in turn hires an old friend of his, a handsome, charming loose cannon named Bill Schell (Don DeFore). Dave is determined that everything the Circle 66 does to fight Ivey be above board, but Connie and Bill have their own ideas. Connie may have made the decent and honest Dave “ramrod” of her outfit, but it’s the violent Bill Schell who is the true instrument of her will. 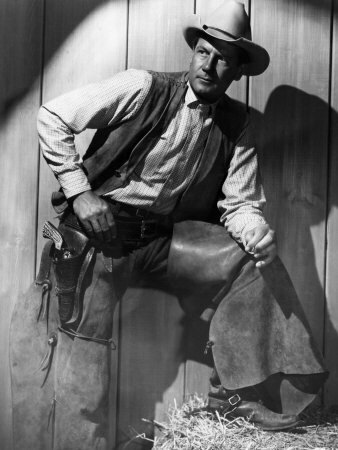 Joel McCrea has the pleasantly handsome, soft-featured face of the dad next door, but he’s tall enough and projects enough quiet menace to be convincing as the ramrod of the Circle 66 ranch. Don DeFore, who usually played pleasant, jovial men, is excellent playing against type as a cold-blooded gunman. Ramrod is a great western. It’s based on a novel by Luke Short, and de Toth does an excellent job of capturing Short’s hard-boiled western prose and talent for characterization. The tone of the picture is closer to the film noirs of the period than it is to the westerns. In Ramrod, de Toth creates a grim, violent world in which the righteous are just as likely to die as the wicked. Fistfights in this film don’t end with a bunch of broken furniture, they end with blood. A group of Ivey’s men beat an unarmed cowhand to death in front of Connie. When Bill Schell slaps a man in the face to enrage him, he tells Bill that he won’t be “rawhided” into drawing, so Bill burns his hand with a cigar. When Ivey shoots a man, he steps forward and finishes him off with another shot. Ramrod ends with a shootout, of course, but it doesn’t end with a quick draw or any fancy trick shooting. It ends with a shotgun blast to the gut. True to the noir tone of the film, there’s a “good girl” to counterbalance Connie, named Rose (Arleen Whelan). The intertwined relationships of Dave, Bill, Connie, and Rose are well-played, and evolve naturally over the course of the film. Character drives the plot of Ramrod forward as much as bullets and fists. Ramrod premiered on Friday, February 21, 1947, in Salt Lake City, at both the Utah and Capitol theaters. The world premiere event was part of Utah’s centennial celebration as a U.S. Territory. Ramrod went into wide release on May 2, 1947. Posted in 1947, February 1947 and tagged Adolph Deutsch, André de Toth, Arleen Whelan, C. Graham Baker, Cecile Kramer, Charles Ruggles, Don DeFore, Donald Crisp, Enterprise Productions, Eugene Strong, Hal Taliaferro, Harry Sherman, Houseley Stevenson, Ian MacDonald, Jack Moffitt, Jeff Corey, Joel McCrea, Lloyd Bridges, Luke Short, Nestor Paiva, Preston Foster, Ramrod, Ray Teal, Russell Harlan, Sarah Padden, Sherman A. Rose, United Artists, Veronica Lake, Victor Potel, Wally Cassell, Ward Wood, Westerns. Bookmark the permalink. A Walk in the Sun had its premiere on Monday, December 3, 1945, and went into wide release on Christmas day. Produced and directed by Lewis Milestone, the director of All Quiet on the Western Front (1930), A Walk in the Sun tells the story of the ordinary men who serve in the infantry. Long stretches of the film are filled with the men’s meandering thoughts (both in voiceover and spoken aloud) and their circuitous conversations. When violence occurs, it comes suddenly, and its larger significance is unknown. The film’s exploration of the infantryman’s P.O.V. is similar to William A. Wellman’s The Story of G.I. Joe, released earlier the same year. (Burgess Meredith, who played Ernie Pyle in that film, narrates A Walk in the Sun, although he is not listed in the film’s credits. When I first watched this film I was sure it was Henry Fonda’s voice I was hearing. I was surprised when I looked it up and found out it was Meredith.) Unlike The Story of G.I. Joe, however, A Walk in the Sun covers a much briefer period of time (from a pre-dawn landing to noon the same day), and its ending is more heroic, with little sense of loss or tragedy. Based on the novel by Harry Brown, A Walk in the Sun takes place in 1943, and tells the story of the lead platoon of the Texas division, and their landing on the beach in Salerno, Italy. 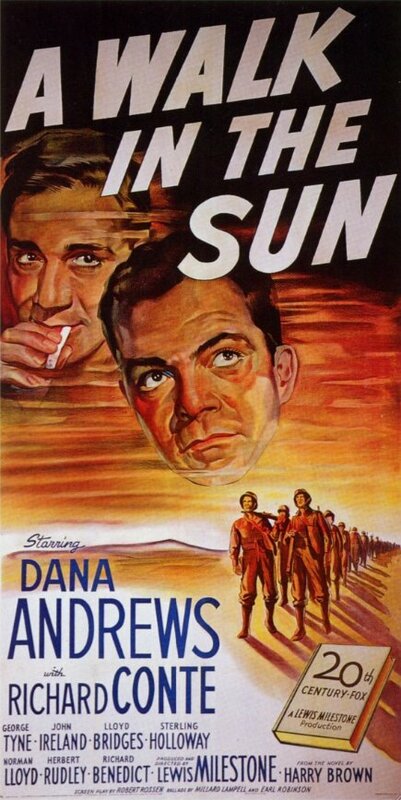 Square-jawed Dana Andrews plays Staff Sgt. Bill Tyne, a simple man who never had much desire to travel outside of his hometown of Providence, Rhode Island. Richard Conte plays the Italian-American Pvt. Rivera, a tough soldier who loves opera and wants a wife and lots of children some day. George Tyne plays Pvt. Jake Friedman, a born-and-bred New Yorker. John Ireland plays PFC Windy Craven, a minister’s son from Canton, Ohio, who writes letters to his sister in his head, speaking the words aloud. Lloyd Bridges plays Staff Sgt. Ward, a baby-faced, pipe-smoking farmer. Sterling Holloway plays McWilliams, the platoon’s medic, who is Southern, speaks very slowly, and just might be a little touched. Norman Lloyd plays Pvt. Archimbeau, “platoon scout and prophet,” as Meredith describes him in the opening narration; Archimbeau talks incessantly of the war in Tibet he theorizes will occur in the ’50s. Herbert Rudley plays Staff Sgt. Eddie Porter, an opinionated guy who’s always looking for an argument (Normal Rockwell’s wasting his time painting photo-realistic covers for the Saturday Evening Post, Porter says. He should use a camera. Some day magazine covers will have moving pictures on them anyway.) Richard Benedict plays Pvt. Tranella, who “speaks two languages, Italian and Brooklyn,” and whose fluency in the former will prove useful when the platoon runs across two Italian deserters. All of these “types” seem clichéd now, but they’re probably not unrealistic characters for the time. The only really dated thing about A Walk in the Sun is the song that appears throughout the film, and helps to narrate the action. “It Was Just a Little Walk in the Sun,” with music by Earl Robinson and lyrics by Millard Lampell, is sung by Kenneth Spencer in the deep, mournful style of a spiritual. I didn’t dislike the song, but its frequent appearance as a kind of Greek chorus felt intrusive. One thing that really impressed me about A Walk in the Sun was the cinematography by Russell Harlan. While A Walk in the Sun is clearly filmed in California, Harlan makes the most of starkly contrasted black and white shots that could have been shot anywhere. One of the film’s motifs is black figures against a white sky. There are a couple of scenes that reminded me of the famous final scene in Ingmar Bergman’s The Seventh Seal (1957) in which death leads a procession of people down a hill. Several times in A Walk in the Sun, the platoon is depicted as groups of indistinguishable black figures walking down a black hillside, silhouetted against a completely white sky. And in keeping with the infantryman’s P.O.V., when the platoon lies down to rest there are a couple of shots from the ground, looking up at the sky, while arms reach up across the frame and exchange cigarettes. Posted in 1945, December 1945 and tagged 20th Century-Fox, A Walk in the Sun, Alvin Hammer, Burgess Meredith, Chris Drake, Dana Andrews, Duncan Mansfield, Earl Robinson, Fredric Efrem Rich, George Offerman Jr., George Tyne, Harry Brown, Herbert Rudley, Huntz Hall, James Cardwell, Jay Norris, John Ireland, John Kellogg, Kenneth Spencer, Lewis Milestone, Lloyd Bridges, Matt Willis, Millard Lampell, Norman Lloyd, Richard Benedict, Richard Conte, Robert Rossen, Russell Harlan, Sterling Holloway, Steve Brodie, Victor Cutler, War Movies, World War II. Bookmark the permalink.